Back swimming at Jordanelle. 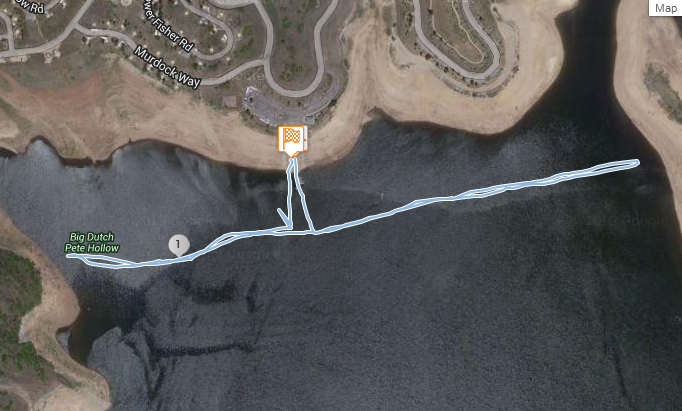 One lap of the buoy line. This morning I got up early to go swim at Jordanelle with Goody and Liz. I haven't swam there at all since last year (I think my Thanksgiving polar swim was the last time I was there). I had heard the water was warming up and the water level is much higher than last year, so I really wanted to check it out. When I pulled up, Liz was just getting ready to go down to the boat ramp. I saw Goody already swimming from the parking lot. I dropped in my thermometer while I got ready. It read 70 degrees by the time I got in the water. I thought it seemed a bit high, but it was still 70 when I got out. It felt a bit chilly for the first little bit, probably because the air temperature was cooler than I have been used to. After I got warmed up, it felt great. I stopped a couple times to talk briefly with Goody and another time to take some pictures (forgot my camera, will upload photos later). It's good to be back up there. The water was nice, the surroundings are beautiful, and the water level is much higher than last year. On a side note, I found an iPhone at the bottom of the lake on my way in. I was going to turn it in, but no one was at the office. If I can get it to dry out and turn it back on, I'll try to figure out who it belongs to. It would sure make a cool story if I could track down the owner. Anyway, I plan to go up to Jordanelle a couple times a week. I will post on the Salt Lake Open Water and Utah Open Water Facebook pages when I am going. This place looks exotic. The water looks clean. It must be worth swimming in that water. Discovering new adventurous and beautiful places is my hobby too.